Bring the relaxing sound of water to your outdoor space. With Master Plan Landscapes, water features are incorporated at the right scale for your landscape plan. From small waterfalls to streambeds and ponds, our water features provide life and tranquility. And, the wide variety of aquatic plants and in-water lighting systems add even more appeal to any water feature. 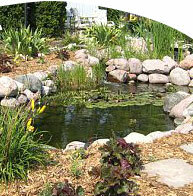 Water Feature services include site evaluation, selection of plants and fish, illumination, and maintenance.